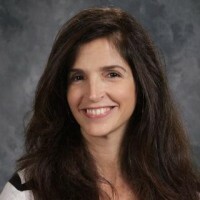 Selected by students of merit as a teacher who "Made a Difference" in the life of those students and acknowledged for excellence as a distinguished educator in Who's Who Among America's Teachers 2000, 2002 & 2004. Recognized as an outstanding educator whose dedication, commitment, and guidance are represented by student work selected for National Honors (1) 2016, (2) 2017, (1) 2018 and American Voices nominee (1) 2018 by Scholastic Art & Writing Awards. Nominated by Dr. Lichter as Catholic Educator of the Year for "educators who live their school's mission and impact the faith life of others" by Catholic Financial Life 2013. Certification of Appreciation from Cardinal Stritch University-Office of Field Experience and Clinical for Service as a Cooperating Teacher 2014. 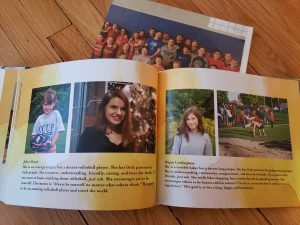 Recognized as a teacher who "inspired a love of learning and captured memories which makes you the kind of teacher students will remember for the rest of their lives" by Scholastic Student Treasures Team 2016. District Speech Contest School trophy 2017 by Modern Woodmen of America. Speech theme: "What does it mean to be a hero?" 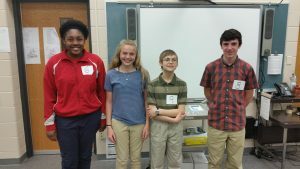 ASCS students placed 1st, 2nd, and 3rd at District Level 2 (hosted by Randall Consolidated). Winners all advanced to State Level 3 contest where one ASCS student placed 3rd. I believe "Earth's crammed with Heaven." St. Mary Catholic Parish and Elementary School in Kenosha are where my own Christian formation began. It's an honor and extraordinarily rewarding to be working at All Saints Catholic School. Our school is truly a profound blessing for our community. To me, happiness is teaching... especially with wonderful colleagues, kind families, and hardworking students. Ray Bradbury once said, "Jump off the cliff and learn how to make wings on the way down." This is good advice for writers, and it captures what my students do as they develop, research, revise and refine their writing. 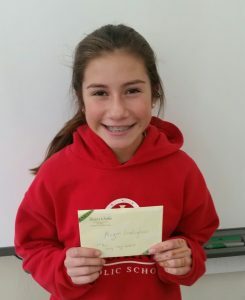 It is so thrilling when my students enter writing contests and get recognized. It shows them how powerful and rewarding writing and their point of view can be. Lastly, I thought this tweet pretty much sums it up--Top Ten reasons why teaching middle school is the best job ever: 1 Middle school students tell it like it is. 2 They have a ridiculous sense of humor. 3 You have an endless supply of funny stories at parties. 4 People bless you often. 5 Middle school students have hope. 6 You have celebrity status. 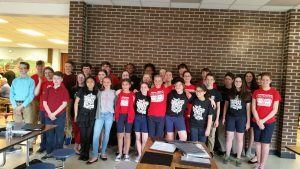 7 Middle school students need you. 8 Every emotion is heightened--they love with their whole heart. 9 You become part of a special tribe. 10 You live in an Axe body spray ad. Mentor text: James Howe's "Everything will be Okay"
Language Arts Retake Policy: Guidelines are currently under review. For now, spelling tests are to be retaken in a timely manner after completing practice work. Grammar unit tests are to be retaken after practicing the learning targets and preparing by the specified due date. No exceptions on due date. Above is article link entitled "10 Ways to take the struggle out of homework"
Fall 2018: Student supplies for language arts class include the following: one package of loose leaf paper, one folder or binder, one spiral notebook, hand-held pencil sharpener, post-its, and one package of index cards. Parents, please sign up for important updates from me. Get information right on your phone with REMIND app in the fall. To get text notifications: text the message @ga3c4dk to the number 81010 To get email notifications: go to rmd.at/ga3c4dk on a desktop computer. 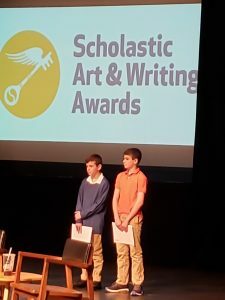 Grades 6-7: Kenosha County Education Fair: Students submit a writing piece of their choice (May 25th) to see if it will be recognized for a blue/red/white ribbon award in its category. Judging takes place over the summer. We receive recognition ribbons & checks ($1-5) in September. Grades 6-8: Guest Speakers: We welcome librarian Pamela Penza from KPL who teaches a class on research skills (www.mykpl.info) and a class on computer science. (www.code.org and www.codecademy.com) We also welcome Father Bob Weighner from St. Anne to discuss Church's views on position paper topics. 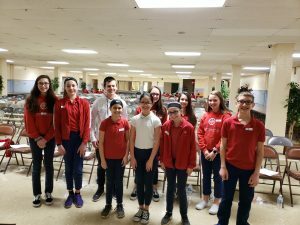 Grades 6-8: ASCS Forensics Team: We perform our programs at the 45th annual Westosha Junior High Forensics Competition in April -- Play-acting, Interpretation of Prose or Poetry, Informative speech, Readers Theatre, Storytelling, Solo acting, Persuasive speech, Demonstration speech. We meet Fridays from 3-4:00 pm in Room 304. 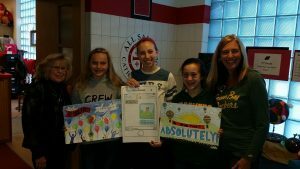 Grades 6-7: Scholastic's Student Treasures publishes books written and illustrated by the students. Grade 7: ASCS Comma Contest: Signatures are collected, and we celebrate our love of the comma on Valentine's Day. The school record is 5,007! Congratulations to Abigail Z and Keegan B!!!! Grades 6-8: Kusd's Drug Awareness ATOD Creative Writing & Poster Contest--deadline January. Winners use positive themes and center it around winning slogan. April at ITA is the Awards brunch! Congratulations Grace H. (Third Place in Creative Writing). Grades 7-8: Southeast Wisconsin Scholastic Art & Writing Contest--deadline January www.artandwriting.org/Login. Award Ceremony is held at UW-Parkside. 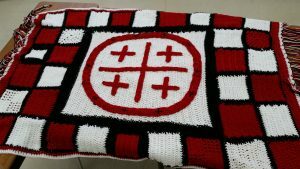 Congratulations to Katelyn R., Ian I., and Alex G.
Grades 5-8: ASCS Crochet Club 2018-2019: Meets Tuesdays from 3-4:00 pm in Room 304 monthly. Grades 6-8: "What is a healthy community to you?" 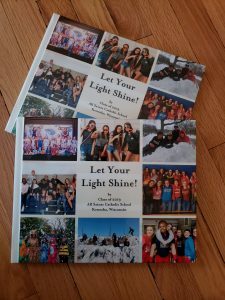 LIHF of Kenosha Essay Contest due in early October. Grades 7-8: Knights of Columbus's Respect Life Essay Contest due in mid October. 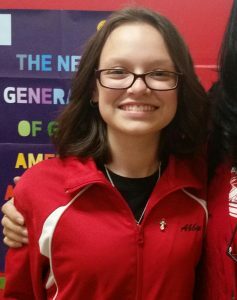 Congratulations to Allie P. for winning First Place! Grades 6-8: KPL Scary Story Contest due in late October. Congratulations to Megan L. First Place two years in a row!!!! Grades 3-8: Scripps Spelling Bee: About 11 million participate in this highest of profile school contests. We host our All-School Spelling Bee at our All Saints Day event. 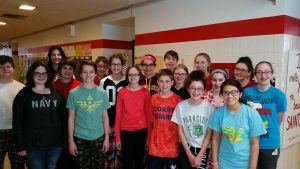 The Regional Bee is held in February in Pewaukee. Congratulations to our champs Ariana E. and Samantha W.
This is my LIBRARY or COLLECTION of Links to online resources and games. When students need to access any of these, I add it to my HOMEWORK page. 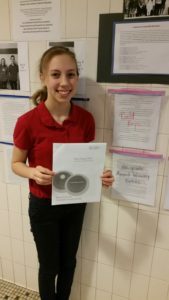 Sarah is the winner of 2016's National Silver Medal from Scholastic Writing for her personal narrative. 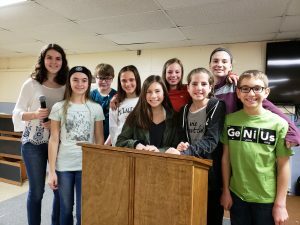 2019 School Speech Contestants. Congratulations to Katelyn, Gianna, Jonathan, Robert, Sarah, Viammy, Gillian, Allie, Haley, Ava!! Topic "Challenges Youth Face"
KLIHF Essay Winners Olivia W. and Haley L. "What makes a healthy community?" 2018 Modern Woodmen Speech contestants and emcee. Two advanced to Districts and earned 2nd & 3rd Place. 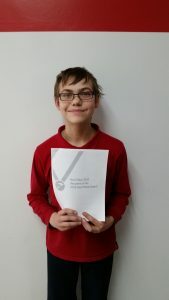 John is the winner of 2018 Scholastic Writing's National Silver Medal for his poetry and American Voices Nominee. 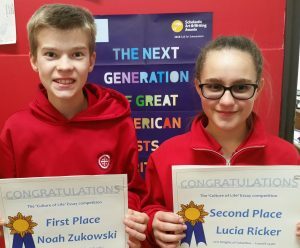 Culture of Life Essay winners Noah and Lucia! 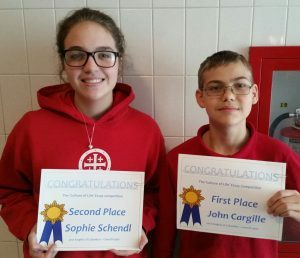 Culture of Life essay contest winners John and Sophie. Abigail won 2nd Place in 2017 KPL's Scary Story contest! 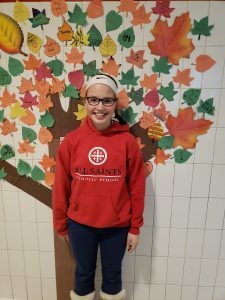 Megan won First Place in the 2018 & 2017 KPL's Scary Story Contest! 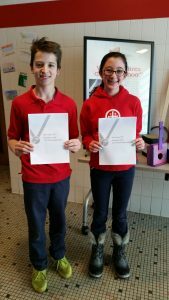 2017 Paul (critical essay) and Riley (personal narrative) are the winners of a National Silver Medal from Scholastic Writing. 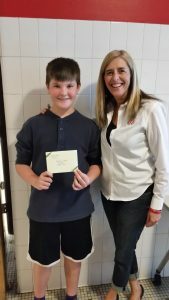 2017 Ben won 2nd Place in the KPL poetry contest!! 2017 District Level 2 speech contest participants Aniyah, Mia, John and Max. Three advanced to State Level 3! 2017 Forensics South, North and West campus Team--all winners of Gold & Silver medals. 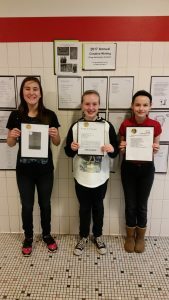 2017 ATOD Drug Awareness Creative Writing winners: Shannon (1st Place), Grace (2nd Place) and Julia (3rd Place). 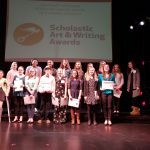 2017 Wisconsin Scholastic Art & Writing Award winners of gold, silver and honorable mentions. 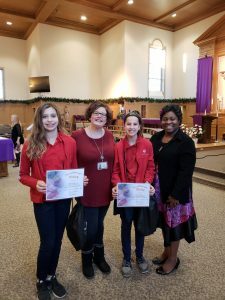 2017 ATOD Drug Awareness Poster Winners: Mia (Overall winner), Sarah (2nd Place) & Alyssa (3rd Place). Over 500 posters were submitted.